Alexander Payne's The Descendants is a perfect family drama that isn't afraid to shed humor onto troubling situations. George Clooney and Shailene Woodley give Oscar worthy performances and the film is one of 2011's best. Director Alexander Payne returns to cinema after a 7 year hiatus with The Descendants; a touching drama starring veteran George Clooney and newcomer Shailene Woodley. The Descendants is an effective family drama that isn’t afraid to shed humor on some of the worst situations life hands to us. It’s a sad and depressing film that hangs onto its central characters long enough to find joy and happiness in the simple things in life such as family and close friends. It’s trademark Payne filmmaking and it makes for one of 2011’s best. Matt King (George Clooney) is a wealthy Hawaiian resident that owns a hefty chunk of land that was passed down from his great descendants. His wife was recently in a boating accident, leaving her bed ridden in a hospital without any real brain function. She’s a vegetable now and Matt uses this time to reflect on their relationship and on the things that he could have done better to support her and show his love. Their relationship was on the rocks and now Matt needs to figure out how to move forward. His plan is to round up his daughters Scottie (Amara Miller) and Alexandra (Shailene Woodley) in preparation for the day that they’ll have to say goodbye to their mother. Matt soon learns from his daughter Alexandra that his wife was in fact cheating on him. Quickly, The Descendants turns from a family drama into a human comedy as Matt and his daughters cruise around Hawaii, looking for his wife’s secret lover. 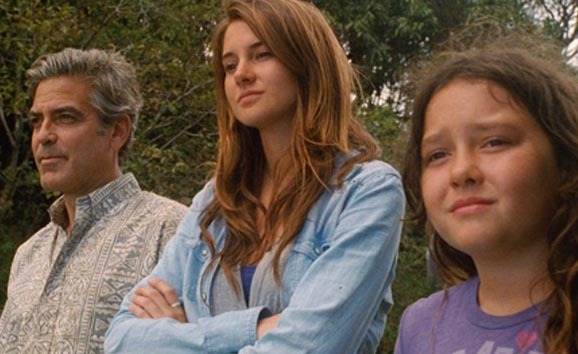 Alexander Payne directs The Descendants with just the right tone. It’s very much a depressing family drama that gives you a firsthand look at how hard relationships are and how hard it is dealing with a loved one in the hospital, but then it jumps into comedy mode and provides some great laughs. The laughs come from the honesty and just how funny real-life situations can be. It’s a great trait the film has because it breaks up some of the real thick drama. As the story progresses, so does the drama and humor. The Descendants is one of those rare films that captures real life events, exactly how they would unfold. You’ve got the absent father that’s too busy with work, the insubordinate older daughter, the sassy young daughter and the idiot boyfriend (who’s providing support for the older daughter). Every character in the film introduces a specific element that Matt must deal with. George Clooney tackles the role of Matt King with every emotion under the sun. He’s pissed, sad and happy over the course of the film. He’s the working father that never spent enough time with his family and now that everything is taking a turn for the worse, he must try his hardest to hold onto what he’s got. His ability to show such honesty and vulnerability when dealing with his wife and her situation is almost tear-inducing. In fact, his last stretch of dialogue towards the end of the film had most audiences in tears and that’s because Clooney is such a star of an actor. Pairing Clooney up with director Alexander Payne was the best idea since Martin Scorsese and Leonardo DiCaprio. The two together make for one of the best films of 2011 because of its honest and approachable direction combined with its Oscar worthy performances. The beautiful Hawaii is recreated with bright colors and clean texture in this 1080p video transfer. The movie was shot on film and that’s very present on this transfer. The transfer looks very natural and consists of a small layer of grain. One thing I noticed is that some of the detail is a little soft and not as clear and sharp as most recent transfers, but it’s not that big of a deal because the transfer on the whole is well-balanced. The 5.1 DTS-HD Master Audio track isn’t going to be blowing speakers or waking the neighbors, but it’s subtle and understandable. Dialogue is clean and strong while surrounding effects like a calm breeze or the sound of the ocean take over the surrounding channels. Deleted Scenes with Director Introductions (HD): 2 deleted scenes with text introduction explaining why they were cut. Everybody Loves George (HD): A feature discussing Mr. Clooney himself. Cast and crew talk about how nice and kind he is. Working with Alexander (HD): Cast and crew discuss what it’s like working with director Alexander Payne. The Real Descendants (HD): President of the Kualoa Ranch, John Morgan, tells a story about a real family that owns a lot of Hawaiian land. Hawaiian Style (HD): A look at shooting on Hawaii as well as the traditional blessing before shooting. Casting (HD): Payne discusses the lengthy process of casting and how many people audition for one single role. Working with Water (HD): Payne discusses the difficulties shooting on water. Music Videos (HD): 3 music videos with Hawaiian footage. Waiting for the Light (HD): On-location behind-the-scenes footage. The World Parade – Hawaii (HD): A silent piece of footage that shows off the old Hawaii. A Conversation with George Clooney and Alexander Payne (HD): Payne and Clooney discuss various aspects of the film. Alexander Payne’s The Descendants is one of those rare films that manages to capture human drama as well as human comedy. It’s a film about families, problems, relationships and life in the most general form. It feels incredibly authentic and universal in its telling of just how precious things in life really are. Clooney gives a career-best performance, full of appreciated love and care, while newcomer Shailene Woodley almost steals the film away as the daughter who speaks her mind and lives by her own rules. It’s a film that is guaranteed to speak with everyone on some sort of level and Fox brings the film to Blu-Ray with a beautiful 1080p video transfer and a faithful 5.1 DTS-HD Master Audio track. The special features are plentiful, but the lack of an audio track is kind of disappointing. At least there’s a DVD and digital copy of the film to take with you.